Arriving with an album in the great horror-rock tradition pioneered by the likes of Screaming Lord Sutch or The Crazy World Of Arthur Brown, Haunted George is the recording alias of Steve Pallow, formerly of '90s bands The Beguiled, Satan's Cheerleaders and The Necessary Evils. 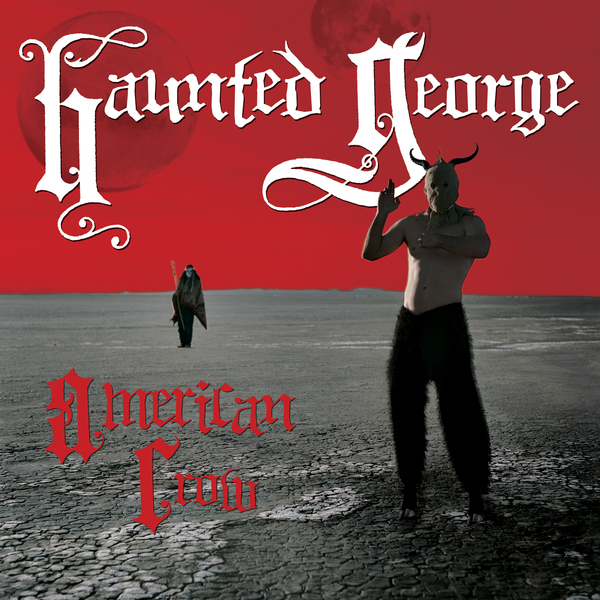 Legend (or at least, the press release) has it that George retreated from normal society a decade or so back, holing up in the Mojave Desert "where he spends his time building caskets, collecting exotic roadkill, making podcasts that have to be heard to be believed and creating nightmarish music". The latter is certainly something I can vouch for. American Crow is the first Haunted George album to break free of the solo lo-fi recording pattern he'd got himself into, and instead involves other musicians and a proper recording studio. The songs keep the creepiness factor ratcheted way up there, sharing some aesthetics with the more angular elements of Tom Waits' catalogue or a rockabilly-leaning Captain Beefheart. Listening to the rustic clamour behind the likes of 'Weeks In A Casket' or the highly alarming 'Hit You With My Hammer', you get the impression that if the family from the Texas Chainsaw Massacre got together to form a garage rock band, maybe this would be the outcome. Crikey.